It’s almost as if Rod Stewart had a vision of Timber Rattlers’ catcher Clint Coulter when he sang those words. Coulter has definitely seen his share of luck (drafted by the Milwaukee Brewers in the 1st round of the 2012 draft) and pain (Clint leads the Midwest League in the dreaded hit-by-pitch category with 16). What happened on Sunday, however, was not your run of the mill plunking. It hit him in the face. It didn’t hit the helmet. It didn’t just buzz the tower. The ball hit him in the side of the face traveling around 90 miles per hour. Unfazed, Coulter headed to 1st base. Sporting a shiner, Coulter was given the day off Monday allowing him to have 2 consecutive days to rest and recover (today is a travel day for the team). Regarding when he will return to the lineup, Erickson was optimistic. 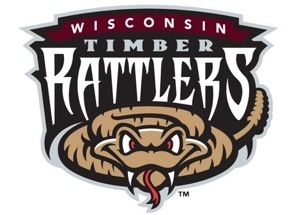 Cream City Cables would like to send a heartfelt congratulations out to Wisconsin Timber Rattlers’ manager Matt Erickson on the occasion of his 216th win as their skipper. The previous franchise wins mark by a manager (215) was held by former Rattlers’ skipper Gary Thurman who coached the Rattlers from 2000-2002. CCC: …you guys come back and put together a pretty nice win today. What were the keys to the game to get that win for you? ME: Before the game we talked as a group, the position players, about how we haven’t been very good with runners in scoring position. We’ve done a nice job in setting the table and getting some of our leadoff guys on and creating some havoc on the bases, but just chasing out of the zone and trying to do a bit too much with runners in scoring position. Today we got a couple big knocks, the biggest one coming to mind being (Jose) Pena’s 2 out, 2 RBI single. That was nice to see, but more importantly than that I think up and down the line we had 17 two strike at bats today. We put the ball in play on 15 of them and only struck out 2 times. When you can do that with the type of speed we have throughout our lineup, we can put some pressure on them. CCC: Speaking of speed, let’s talk a little bit about Johnny Davis. We’re seeing it both on offense and on defense right now. He’s laying out for stuff in center field and he’s stealing bags for you on the base paths. ME: Yeah, it’s fun to see him grow up. As far as a baseball player, he’s obviously a special talent when it comes to movement. He can fly and he’s learning the game day by day. There’s so much for him to learn that he doesn’t know, and he’ll tell you that himself. What’s fun about him is his passion to learn and to play and compete and when you have a guy like that’s willing to do those things, he can get better in a hurry and he can make some plays. Like you said, he not only creates some scoring opportunities with his feet on offense, but he also takes away runs on defense. CCC: Today, we watched him get into the pitcher’s head, kind of shifting back and forth on 2nd. It has got to be outstanding knowing that you have that extra weapon there messing up the pitcher a little bit. ME: Yeah, and it’s not just him. (Francisco) Castillo can run a little bit, (Chris) McFarland at the top of the lineup, (Omar) Garcia can run a little bit and some of our bigger guys. You know (Clint) Coulter and (David) Denson are looking to take extra bases. So, when it comes to Johnny he’s just, well I haven’t seen anybody quite that fast in a T-Rat uniform and he’s getting some decent swings. I like his approach at the plate, he’s understanding who he is, not taking really big swings anymore, and if he does, he’s making the adjustment quicker and today he had some nice swings. You know, he brings them in with his short game and then he slaps the ball around hitting a line drive to the hole to left field. If he can do that consistantly, he’s going to be tough to deal with. CCC: Switching over to the pitching for today, Harvey Martin had two really nice innings to end out the game for you. He had 4 strike outs. You’ve got to be happy with what you saw out there today. ME: Yeah, he’s going to get more stop gap opportunities. Alvin and I were talking about how we need to get him, he’s got a little experience in this league, and he’s one of the nicest kids you’ll ever meet, but he’s got a little attitude to him when he steps on the mound, and it’s fun, another competitor and you can’t teach that stuff. Some of those things are inside people and he wants to compete, he wants the ball every day and he seems to have the arm to do that. When you are running tandems and you’ve got developmental stuff, that’s usually not the case, but he’s a guy we’re not afraid to give the ball to in that situation. CCC: With the off day tomorrow, you guys move on to Burlington starting on Monday, any adjustments you will be looking to make to the lineups heading into that series? ME: No, not really. I like the lineup we threw out there today, some speed at the top and some of our thumpers in middle and then we have a little speed at the bottom of the lineup. As far as the lineup is conserned, we’ll mix them all in, nobody’s going to rot away on the bench here, everybody’s going to get an opportunity and whoever is performing is going to get a bit more opportunity. Sometimes you win. Sometimes you lose. Sometimes you do both in the same day. Welcome to the joys of the double header. After Friday’s game was cancelled due to the never ending icy grip of Mother Nature, the Rattlers announced that the game would be made up on Sunday afternoon as part of pair of 7 inning contests. After the Rattlers evened the series at a game a piece on Saturday, the stage was set for a showdown that was anything but Minor League. You see, Sundays in Appleton are “Brewer Sundays”, a celebration of the team’s Major League affiliation, and what better way to kick off the first one of the season than with a visit from Hall of Famer, Rollie Fingers. Yes, the man, the myth, the mustache was in the house to throw out the ceremonial first pitch and didn’t disappoint, throwing a strike right across the plate. The Chiefs, still stinging from Saturday’s loss, wasted no time going after Rattler starter Anthony Banda. After a throwing error by shortstop Angel Ortega allowed Chiefs’ leadoff hitter C.J. McElroy, Jr. to reach base, second baseman Mason Katz crushed a ball over the wall and gave the Chiefs an early 2-0 lead. They would never look back. Adding an additional run in the 5th, 3 runs would be all it would take to maintain control of Game 1. The Rattlers would not go down without a fight though tallying 2 runs in the 6th as both Ortega and Johnny Davis scored off of a Francisco Castillo single. Your final in Game 1: 3-2 Peoria Chiefs. After a brief intermission, the Rattlers were ready for Game 2 and this time they would strike first blood. The bottom of the 2nd opened up with Rattlers’ 3rd baseman Taylor Brennan working the count full before unleashing a solo homer that gave Wisconsin an early 1-0 lead. Peoria would answer back with a solo homer of their own from Katz in the top of the 6th, knotting the score at 1 run a piece. Realizing that time was of the essense, the Rattlers fired back in the bottom half of the inning with both Davis and Chris McFarland crossing the plate to regain the lead for Wisconsin. Rattlers’ reliever Harvey Martin’s spotless 1-2-3 7th would seal the deal in Game 2. Rattlers win Game 2 3-1. Today’s outcomes bring the 4 game opening series to an end, resulting in a 2-2 record for both teams. The Rattlers now hit the road for a 6 game road trip beginning with 3 games against the West Michigan Whitecaps and concluding with 3 games against the South Bend Silver Hawks. The Rattlers return home on Monday, April 14th as they kick off a 3 game series against the Lansing Lugnuts. It’s a beautiful day for a ballgame. Hey Bernie, let’s play two! – Streak Complete: The Rattlers broke a 7 game losing streak which dated back to the end of the 2013 season yesterday with their 8-4 win over Peoria. – Rattle On: Taylor Brennan found himself on base 4 times yesterday with 2 singles (in the 1st and 3rd) and 2 walks (in the 4th and 7th). – Deja Vu: Speaking of Taylor Brennan; he, along with Michael Ratterree and Clint Coulter each scored runs in back to back innings (the 4th and 5th). That’s 6 runs, 3 players, 2 innings. Impressive! – Saving the Day: Tristan Archer picked up the 1st Rattler save of the season completing 4 innings of work on Saturday. His tandem partner, Barrett Astin, picked up the Rattlers’ 1st win. Can’t make it out to the games today? You can still catch all the action on 1280 WNAM.